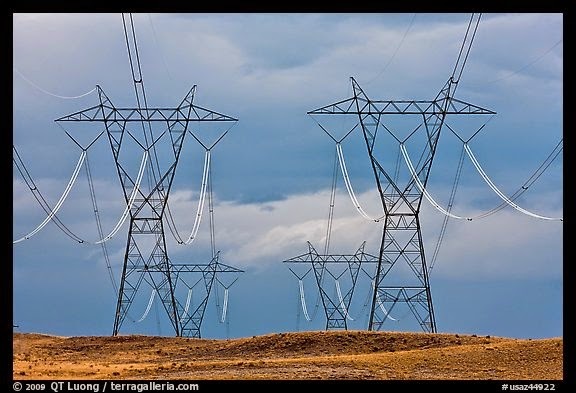 Genomics, Medicine, and Pseudoscience: Do high voltage power lines cause cancer? Do high voltage power lines cause cancer? This could be a very short article. I could just write “no, power lines don’t cause cancer"—but that wouldn't explain why so many people believe otherwise. And it won’t help people who are thinking about buying a home that has power lines nearby. So let’s look at this question a bit more closely. For the past century or more, humans have been surrounding ourselves with an ever-growing array of electrical devices. All of these devices create electrical or magnetic fields, often called EMFs. There’s no doubt that our exposure to EMFs has increased dramatically in modern times. Not surprisingly, many people have worried that this is a bad thing. The belief is so pervasive that NIH has at least two websites devoted to this topic, one by NIEHS and one by NCI, as does the Medical College of Wisconsin. Realtors have created webpages to inform home buyers about how power lines might affect the value of their home. Not surprisingly, you can easily find companies on the Internet that will sell you devices (such as SafeSpace and EMFshield) to protect your body from the supposed perils of EMF. Scientifically, the question at the time was, were these associations real or coincidental? If they were real, what’s the mechanism? Clearly, further studies were needed. Well, twenty years later, the data are in: power lines do not cause cancer. Group 3 means we don’t have any positive evidence that EMFs cause cancer. The only lower category, Group 4, would mean we have evidence that electromagnetic fields do NOT cause cancer, but such evidence is very difficult to produce. In other words, they concluded that the evidence didn't support a link, but more studies might yet find something. After the 2002 report by the WHO, a study in 2005 raised the alarm again. In that study, Gerald Draper and colleagues claimed to find an association between the distance to the nearest high voltage power line and childhood leukemia. Draper found that living less than 200 meters from these power lines (in England and Wales) raised the risk of leukemia significantly compared to living at least 600 meters away. The scientific reaction to the Draper study immediate and highly critical. Hepworth and colleagues pointed out that the results did not support a causal role for electromagnetic fields (which were not measured), but at best a geographic correlation. Kheifets and colleagues demonstrated out that the effect disappeared when the control groups were analyzed differently. Other critiques quickly emerged as well: a sign that science was working to self-correct, as it often does. But Draper’s study was widely reported, while the criticisms were not. The critiques, though, paint a compelling picture that Draper’s work was seriously flawed. This debate sounds very familiar. Many false hypotheses, such as the notion that vaccines cause autism, or that acupuncture can reduce pain, show the same pattern: a few small studies produce weak positive evidence, but then larger, better studies fail to back them up. Proponents always call for more studies, but if the effect is real, it doesn't disappear when you do a bigger study. If anything, the effect should appear stronger. So no, electrical power lines do not cause cancer. But they're still ugly. We should bury them all underground. Unfortunately many people have the habit to cherry pick those studies which proves their point, but [at best] ignore the others or [at worst] claim that those are biased somehow. Does a standing desk lengthen your lifespan?